Larry Hurtado has posted to his blog the review he read of my book, A Man Attested by God, at the Society of Biblical Literature meeting in November. A number of people have asked for my response. I want to begin by expressing my heartfelt appreciation to Larry for his interaction with my work over the past few years. I only began having personal interaction with him three or so years ago when I began presenting pieces of my work at SBL. He has been a gracious conversation partner. And, that conversation has helped me realize that the gap between our readings of Jesus is much smaller than I had initially thought it to be. I have learned the hard way not to take it for granted when someone can be a collegial debating partner in the midst of disagreement around a central aspect of their life’s scholarly work. Larry has been exemplary in this in our conversations over the past few years, even taking time to quickly look over a pre-publication version of my work. His collegiality has helped make my scholarship stronger, including what you might read in A Man Attested by God. Something that gets lost in the reiteration of a paper that was read at the beginning of a session is the conversation that follows. In this case it is a critical absence. And for folks who left the session early this is important for you as well. Toward the end of the conversation we came to this critical point: Hurtado agrees that my interpretation of the Synoptic Gospels is essentially correct. He said that his understanding of why the Gospels were written in some ways analogous to my own sense of why my book needed to be written: the early church was so focused on a divine Christ that he was in danger of being untethered from his life as a man in Galilee. Given his account of Christian origins, this does leave some important disagreements on the table, such as what a first-century Christian audience might be expected to hear and how they would be filling in the gaps of these texts. And of course neither he nor I see the Gospels as arguments against a divine Christology. But he sees the Gospels as attempts to reground the Christian faith in the life of Jesus in Galilee. It was heartening for us to arrive at that point in the conversation. It clarified to me what I had initially found somewhat mystifying in Lord Jesus Christ. One reads about the earliest Pauline material and on seemingly every page Hurtado is confronting us with the “shockingly early” binitarian pattern of Christ devotion. But that language is muted in Hurtado’s discussions of the Gospels, where Jesus is shown to be the center of the story in ways that suggest messiah more than they suggest God. The Gospels might assume a “binitarian” pattern of Christ devotion, but they don’t embody it. They tell the story of the human Jesus. I think that this is the most important thing that was said at the session. 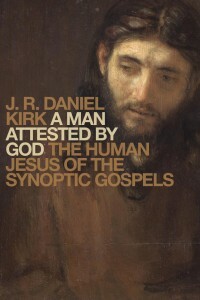 I conclude my response with a brief comment about the tone of Kirk’s A Man Attested by God. 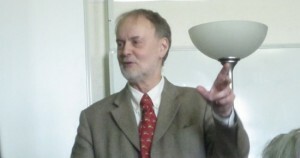 Although “tone” may be a fuzzy concept to apply to a scholarly book, I feel certain you all read enough books to understand what I mean I say that Kirk argues without being viciously argumentative… Kirk shows respect for the work of others even when he disagrees with their conclusions—or presuppositions. The challenge is to genuinely honor [Bauckham and Hurtado] for all that they have done but also to be clear about the problems with grace – which I think you do. I do regret that Larry experienced the book as hostile, but hope that others who read it will continue to have a different impression of my posture toward my interlocutors. I remain singularly unimpressed with Hurtado and Bauckham calling foul on those who recognize their arguments as asserting a nascent-/proto-Chalcedonian Christology in the earliest Christian texts. For example, note Kirk’s statement that the recent “resurgence of early high Christology” involves the notion that already in the NT we have beliefs in Jesus “as divine in what might fairly be called a proto-Chalcedonian sense” (pp.1-2). In a footnote to that statement he refers to me. Now, to speak for myself, I have no recollection of ever alluding to the Chalcedonian definition of the two natures of Christ, nor any sense of how my own work can be linked to it. So I have to say that I find Kirk’s statement a complete puzzle. This is what I mean by “proto-Chalcedonian”: the notion that what the early church was doing and believing was, itself, expressed in the Nicene/Chalcedonian creed. That’s what I mean by proto-Chalcedonian: the “Fathers” “did not develop it.” If it is not developed then it is already there in some sense. This is an ontological claim. Yes, certain theologians such as Bauckham’s mentor Jürgen Moltmann (as well as Jean Luc Marion and others) have tried to avoid the language of “ontology” and some of its philosophical /theological implications; however, what most people mean by “ontology” is that Jesus is none other than the God of the Bible. This is the claim of Bauckham’s work. Hurtado and I are much closer together in our understanding of early Christology than are Bauckham and I. The reason for this is that Hurtado recognizes the tremendous significance of human mediators and has studied these figures in his own research. However, the ultimate differences between us still come down to how to handle the Jewish evidence. Where he sees me over-reading the evidence of worship of human mediator figures, I see him hedging in light of his thesis and the need to have a unique category of worship that distinguishes Jesus from those who came before him. Where he sees no evidence of anyone being treated like Jesus prior to the early Jesus movement, I see evidence that Jews who believed their messiah had come and been exalted by God might well incorporate this messiah into their corporate life in ways manifested by the early church. This is where the debates should continue to play out. The theses I have chosen to engage in A Man Attested by God all claim that for a first century Jew to say the things that the early Christians said about God they would be depicting a being who transcends even an exalted human identity. There is only one way to say such a thing with integrity: to know the Jewish material and make a case in light of what was said and done previously. This is what I have done. To my mind the notion of “divine identity Christology” as articulated by Bauckham is completely falsified by the Jewish evidence and should be abandoned. The claims of Hurtado are somewhat more defensible because more restrained. However, when it comes to the Gospels there has yet to be a rubric for articulating early divine Christology that can bear the weight of the evidence. At best, the Gospels provide hints at what will later become Christ devotion. Jesus is not depicted as the shared object of the church’s veneration in these texts, even as he gathers and redefines the people of God around himself. This is what would be necessary for the Gospels to participate in Hurtado’s thesis about early binitarian patterns of devotion. Why they don’t so participate is itself a question worth asking in the on-going quest for a clear understanding of Christian origins. In contrast to Bauckham’s thesis there is no sitting on God’s own throne or Jesus participating in the work of creation or receiving worship in Matthew, Mark, or Luke. So for all its heft, my book makes a modest claim: if we want to claim for the Synoptic Gospels what neither the narrator says nor Jesus claims for himself nor any other character in the story articulates (i.e., that Jesus is God), new frameworks will have to be made that can bear the weight of the evidence of these particular pieces of literature.